We currently integrate with Xero Practice Manager to allow Practice Ignition to import your client and prospect database, and automatically create jobs and push across client information. To connect your Xero Practice Manager account, simply click the Xero Practice Manager Icon to get started. You'll be prompted to log in to Xero Practice Manager if you aren't already logged in. Once logged in, you will be prompted to authorise the connection between Practice Ignition and Xero Practice Manager. Please note - Be sure to select the correct account if you have multiple Xero Practice Manager accounts. 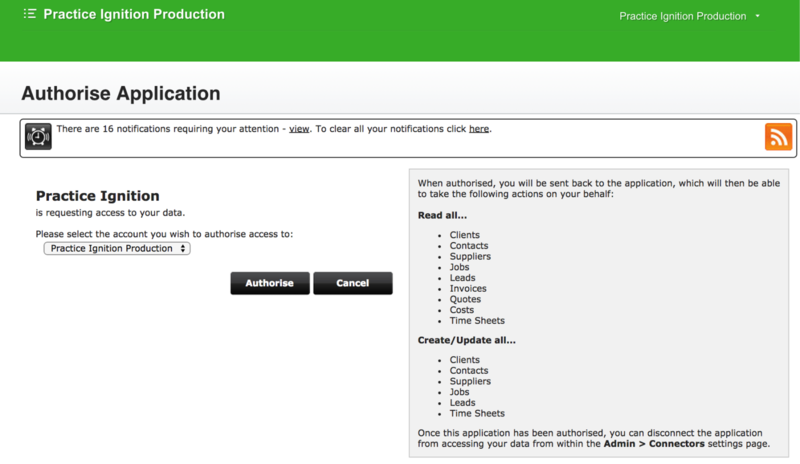 Simply click the Authorise button and it will connect. If you did not connect to Xero Practice Manager in your initial set up, you can always go back and connect later on. To do this, click the Apps menu on the left and click the toggle below Xero Practice Manager to connect. From here the process is the same as the above - you'll be prompted to log in to Xero and Authorize the connection. Learn more about the payments feature here. Practice Ignition does a re-sync every hour for active accounts (where someone has signed in, in the past 24 hours) This pushes data from Xero Practice Manager into Practice Ignition. However if you make a change to the client/job data in Xero Practice Manager that you want showing up in Practice Ignition right away, you can press the Sync link next to the toggle to push through an instant sync. A pop-up notification will let you know that your Xero Practice Manager data is being fetched and more notifications will let you know as imports are completed and Practice Ignition is updated. If you don't need to connect to Xero Practice Manager right now or have already done so, you are ready to turn on your Payments.